Day 2  Arrive in Casablanca at the Mohammed V International Airport (CMN). You will be met by your guide and transferred to your hotel. BAI TRIP STARTS. Day 3  In the morning we will drive from Casablanca to Fes. On our way we will stop and visit the Roman ruins of Volubilis which are found along the villages’ hillside. This is the site where the remains of great palaces, traditional baths, soaring arches and mosaics sit waiting to be explored. We will then continue onto Meknes where we will stop in both the old Medina as well as the modern areas of the city. After a full day of sightseeing we will arrive in the city of Fes, which was the medieval capital of Morocco founded in 789, where we will settle into our hotel. Day 4  Today will be a free day to tour the city of Fes. We will begin our day with a traditional Moroccan breakfast before we make our way into the ancient white city. We will enjoy the morning visiting some of the most well-known places in the city; the Royal Palace and the Christian and Jewish Quarter. We will also visit the Medina, also known as the old city which was declared a UNESCO World Heritage Site and is believed to be one of the world’s largest car free urban areas. In the afternoon we will have the opportunity to visit more of this fascinating ancient city or we can return to our hotel for rest and relaxation. Day 5  In the morning we will depart Fes on our way to Merzouga. The drive through the beautiful cedar oak trees will seem even more incredible when we stop to enjoy the Barbary macaque monkeys climbing through them. As we drive through the mostly dessert like scenery we will eventually begin to see the first dunes after Erfoud. The Erg Chebbi dunes are one of the greatest sights in Morocco and we will be spending a night in a Riad close by. Day 6  Today will be a day of unique adventures and new friendly faces. We will wake up in the early morning and begin our day with a unique experience; a camel trek around the dunes of Erg Chebbi. While enjoying the incredible views offered in the Sahara desert we will also be stopping in the village of Merzouga to have lunch with a local family. In the afternoon we will drive through the dunes and visit a nomad family and enjoy tea under a traditional tent with these fascinating people whose way of life has barely changed in centuries! We will then drive to our luxury tented camp in the middle of the dunes. In the evening we will climb the dunes and sit and enjoy the tranquility and beauty of the desert as we enjoy a magical sunset. Day 7  We will wake in the early morning to watch the breathtaking sunrise over the dunes of Erg Chebbi. We will begin our journey for the day through the palm groves of Tafilalt and Rissani, which is the capital of the current ruling dynasty, the Alaouites. We will then drive towards the town of Tinghir which is built right by the famous Todra gorges. We stop at the gorges and awe at their 250m-high cliffs with surrounding views of various mountains, palm groves and stony deserts. We will then pass through the capital of the valley of roses, where the flower is grown, distilled and celebrated every spring in the festival of Moussem. Rose water, which is clear in color, is revered in Morocco and this prized product which takes many tons of petals for a just a few liters will be offered to guests before meals as a symbol of hospitality. We will end the day in a comfortable Riad in Ouarzazate. Day 8  Our day will begin with a visit to another UNESCO world heritage site, the protected site of Ait Ben Haddou, an impressive Kasbah and well-preserved fortress in Morocco situated along the former caravan route on a hill along the Ounila River. This well-known fortified city has been a place where many movies have been filmed including; the Gladiator, the Mummy, Kingdom of Heaven and Prince of Persia, in most recent years. From here we will begin our journey to the Atlas Mountains. Our drive along the highest road pass in Morocco will be complete with stunning views of the valleys, mountains and many Berber villages before reaching our destination, Toubkal National Park. Day 9  We begin hiking through beautiful valleys with captivating scenery typical of the arid Atlas Mountains. Before reaching our camp at the foot of Toubkal we will stop at the marabout (tomb) of Sidi Chamharouche, the saint of the valley, who the town is named after. 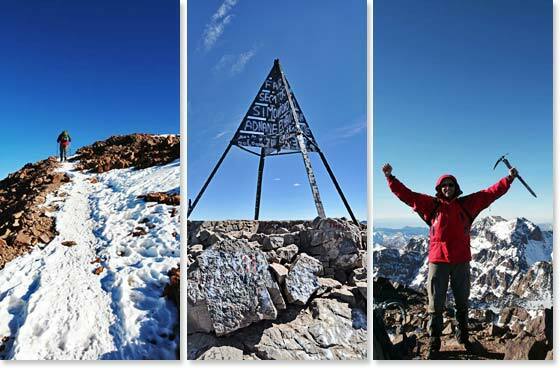 This popular place for Moroccan pilgrims to visit is located at 7,544 ft/2,300m. We will hike from here up a steep path to reach our refuge at the base of Toubkal at 10,496ft/3,199m. Day 10 SUMMIT DAY! We will begin in the early morning up the boulder paths. The climb is not technical but will present us with some rocky and steep terrain. Once we reach the summit of Toubkal Mountain at 13,671ft/4,166m we will have rewarding views from the Sahara to the Marrakesh plains and up to the surrounding peaks of the Atlas Mountains. We will descend back to Neltner Refuge for a night of rest. Day 11  We begin our descent to the Imlil village. On our way we will admire the mountainous landscapes, beautiful flowered scenery and small villages present along the trial. Once we arrive in Imlil we will be picked up and transferred to our hotel in Marrakesh. Day 12  Free day in Marrakesh. This day will be devoted to exploring Morocco’s the second oldest Imperial city which is also known as “The Peal of the South”. In the afternoon we will explore the souks (local markets) and the heart of Marrakesh; the world famous Djemaa El Fna Square where you will be enlightened and entertained by the traditional Moroccan culture. Day 13  International flights home. BAI TRIP ENDS. Day 14  Arrive home .